"Anyone who thinks that gardening begins in the spring and ends in the fall is missing the best part of the whole year, for gardening begins in January, with the dream." Unlike most of Canada, we on the west coast are experiencing an extremely mild winter. So mild that yesterday I went out and did a little gardening. Just some tidying up of pots - my geraniums are still green and I cut them back as they were looking scraggly. As I pottered about inspecting here and there, I noticed sharp pointed green shoots jutting from the earth, soon to be flowering bulbs. Snowdrops glow bright against the dark soil; no snow here this year. I picked a bunch for the kitchen windowsill. On this afternoon's walk around Rithet's Bog, I took a couple of photos and then my battery died. Poor planning on my part. It was lovely to see blue sky. The wind was sharp and I was glad for a jacket I could zip up to keep my neck warm. Home just in time to enjoy a piece of the Lemon Sour Cream pie I referred to in last week's post. A regular-sized piece for him, a narrow piece for me. How delicious it was! Lemons and tulips - surely spring can't be far away! Tonight we witnessed the Lunar Eclipse of the Wolf Moon. 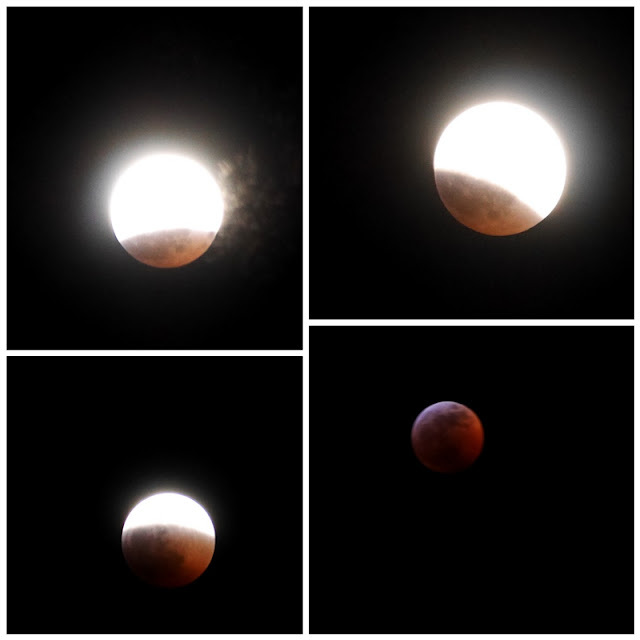 My camera struggled to focus, but managed to capture a few shots of the progression. I balanced the camera on the roof of my car and noticed that frost was already beginning to form. It's going to be chilly tonight. Did you see the eclipse? Linking to Mosaic Monday, hosted by Angie of Letting Go of the Bay Leaf. Dear Lorrie - there's your beautiful Galanthus elwesii var elwesii again which I recall from our conversation last year. The last photo of the moon looking such a lovely shade of red is beautiful, I admire your restrain with the lemon pie. I thought of our discussion about snowdrops last year when I posted this. Beautiful photos! Nice Moon pictures. I slept through the night, missed the event if it could be seen here. I am always so happy to see the first snowdrops in the garden. Mine are sparse but they are there! I don't have many, and there is a clump that grows hidden from sight, so I pick those and leave the rest to admire from my windows. Hello, gorgeous capture of the moon. I fell asleep and missed it all. Your lemon pie looks yummy. Pretty flowers. Happy Monday, enjoy your day and new week ahead. You got some wonderful shots of the eclipse. It was after midnight here and I was sleeping. How wonderful that you managed to see the moon i all its glory. Sadly, there was too much cloud here. The lemon pie looks delicious, what a treat. Who needs to stay up all night when we have you. Your shots of the Wolf Moon are spectacular. I will have to remember to twist lemon slices as you did for your pie and your little snowdrops give us hope that Spring will come. Ron had a very early morning so he did not stay up, but Bekah and I took a quick peek at the moon around midnight! It was C O L D . . . about 15 degrees . . . so our peek was quick, but worth it. Your photos are fabulous! Oooo, your pie looks yummy! Are those candied lemon slices on top? No, the lemon slices are fresh - Meyer lemons - I like the tartness in contrast to the sweet pie, so Tim gives me his slices. No way to see the moon last night. Still overcast from the storm as it is indeed today. I enjoy hearing about mild winters and am glad that they exist. How nice to have tender blooms on your windowsill plucked from your own garden and reminding you of spring. I dare not even think of spring as we have not yet reached mid-winter. Lemon pie and tulips do complement each other beautifully. Your snowdrops are perfectly lovely. And I am so impressed with your moon shots....I forgot! .... Our daughter has been out in her (Oregon) garden or yard every day lately she tells me ... temps there today were similar to ours here in Florida as we’ve caught the tiny tail end of the horrible East coast weather. That’s warm winter temps for the Pacific Northwest, but cold for Florida. All in one’s perspective. I ought to prune the geraniums, thanks for the reminder. I live in California. This year we've been getting a slightly wet winter, hurrah. Yesterday I played in the garden for an hour, putting a few cuttings into the ground. It felt good getting my hands dirty. Your eclipse photos are awesome. Sometimes it's hard to believe that we live in the same country...While you were gardening, we were digging ourselves out after a triple threat (snow, high winds, extreme cold) snowstorm dumped 40 cm of snow on us. I missed the eclipse so thanks for sharing your photos. You got some great shots of the eclipse process. I tried, but got nothing like this. I found it interesting how the blood moom looked so round and planet like. I didn't see the eclipse, Lorrie. My husband did stay up and outside all night with his telescope and cameras though. That lemon pie looks so tempting! 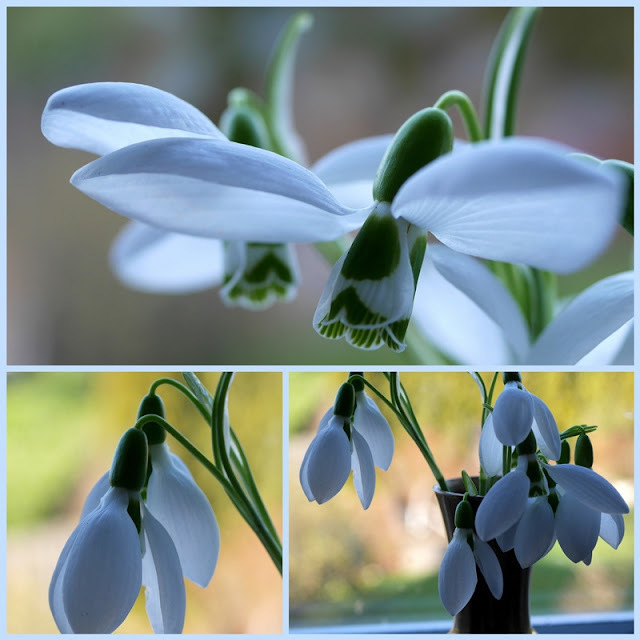 Lorrie - the only white around here is snow … so I am glad to see your snowdrops gracing your windowsill. Tomorrow I will attend a meeting of our church flower committee, and so I've been browsing Pinterest for Easter church decorations - I am excited for tulips and daffs and all the other bright-faced flowers of spring! I didn't even know an eclipse was happening - head in the snow, as usual - I am impressed with your photography as my moon shots are always abysmal. So glad you added your collages to Mosaic Monday! I am intrigued by your snowdrops. What pretty little flowers they are. I have never grown them, but think that needs to change as it would be lovely to see something blooming sometime soon. Your pie and tulips are a breath of springtime. What a pretty combination. Great shots of the moon. I missed it all so am glad to see the wonderful photos people were able to capture. I was disappointed to miss the eclipse but it hadn't started here in Michigan till after 11 and I pooped out! I think I'll have to go back and find that sour cream lemon pie -- it looks delicious and I have a soft spot for lemon. Lucky you, gardening! We are in the sub-zero zone these days. Can't complain -- till now, winter has been very mild! Thanks for stopping by Marmelade Gypsy! Your snow grow collage is divine <3 And the lemon pie makes my mouth water :) The wolf moon is also stunning, we had it cloudy... Wishing you a great week Lorrie. I always love the titles of your posts. The photos are fabulous - especially the pie. We did see the eclipse and my camera had a hard time focusing also - and indeed frost was beginning to form - it felt good to be back indoors where it was warm and toasty. Have a grand week my dear. Always amazed at the beauty and content of your photographs. It has been a frigid week-end in Ontario, but I am so thankful to see blue skies and sunshine during ths time along with snow. It had previously a very dull fall and winter. Seeing those sweet blue flowers give us all hope for spring. I can almost taste the sour lemon cream pie. Looks so delicious and my tastebuds are going into overtime. Enjoy! awesome photos...Lemon Sour Cream pie sounds delicious. Your pie looks and sounds amazing. I love how you decorated the top . . .so pretty. I don't know which of these fabulous photos have mesmerized me more...but that pie looks like it came right out of a magazine. If it looked that good, I'm sure it tasted even better! I've never seen snow drops...how very lovely they are! You really got some amazing photos of the moon. We went outside every few minutes to look and take another photo. It was quite a sight when it turned so red! Love your pretty flowers and pie. I should have bought a bouquet this week. Maybe I will next trip to the store! Hugs! Your tulips and snowdrops a delight. What a wonderful post, Lorrie! The pie and the tulips look lovely and especially the last photo of the moon, when it's totally eclipsed, is stunningly beautiful. It was rather disappointing that here it was cold (-25 C), which usually means a clear sky, but the weather was cloudy. I adore Snowdrops, such lovely, dainty flowers. I love that they peep their heads out while it's still winter. We actually have them here in our area; I used to think it was too warm in our climate for them, but I've seen them in more than one place. I also adore lemon pie ;D and yours looks yummy. I like to make lemon chess pie, but I've pinned your recipe to try sometime. Your pictures of the lunar eclipse are great. My husband was so disappointed because we actually forgot to look for it. Thanks for sharing the pictures and have a great weekend! We have none of the tiny bulb flowers here and I miss them, must try to get some in the ground next fall. There's something very special about seeing them peep above ground now and your little vase of them is so cheerful. We didn't stay up for the super moon but I wish we had! I think your pictures are the best I've seen so far. use this format - so hope this works. Beautiful moon shots - we watched but didn't get any photos such as you did. are appearing through the ground cover. Very cold here again but it will warm up again soon.